When you first launch Storyline and you are looking at the welcome screen, click the Record Screen option to begin a new project by recording your screen. In an existing project, switch to Story View, go to the Home tab on the ribbon, and click Record Screen. Switch to Slide View, go to the Insert tab on the ribbon, and click Record Screen. Tip: To start a new recording, click the top portion of the Record Screen button. To insert an existing screencast, click the drop-down arrow on the lower portion of the button. 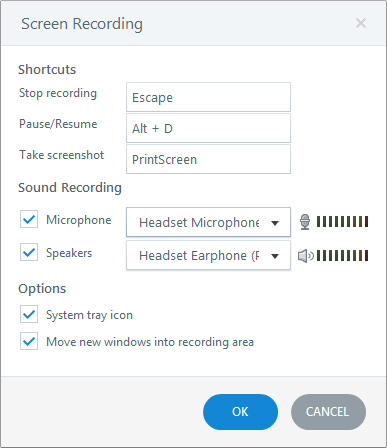 When the Screen Recording window opens, configure the following settings, then click OK.
Use the fields to assign keyboard shortcuts for stopping the recording process, pausing/resuming the recording process, and taking screenshots while recording. Place your cursor in each field and press the desired shortcut key. Speakers: To record system sounds, mark the Speakers box, then use the drop-down list to select the playback device you want to use. Move new windows into recording area: If you're recording a software demonstration or a program that has multiple windows, you may want to mark this box to ensure new windows are visible in the recording area. System tray icon: Mark this box to display a Storyline icon in your system tray while you're recording. If you need to record your system tray and would prefer not to see the Storyline icon in your screencast, uncheck this box. To adjust the size of your recording area, drag the sizing handles on the dashed outline or use the drop-down list on the control bar to select preset dimensions. To adjust the position of your recording area, just drag it to a new location on the screen. The largest screen recording area that's supported is 2046 pixels by 2046 pixels. If you're recording a web application, we recommend using Internet Explorer. 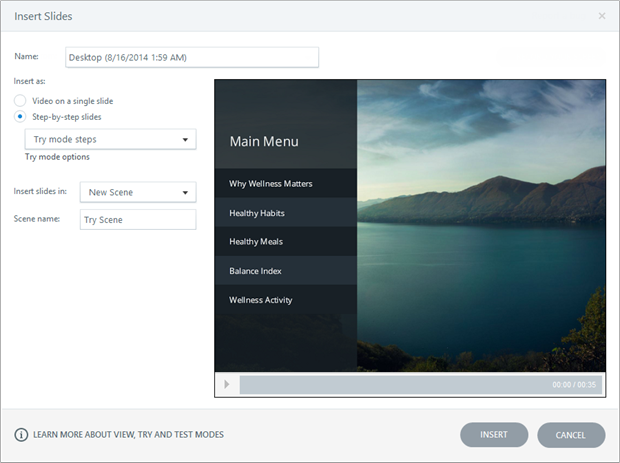 It sends the richest data to the Windows Accessibility API, so Storyline knows what to record. Firefox also works well. Google Chrome reports little information, so caption details will be missing and some steps could be omitted entirely. To exit without recording, click the Cancel button on the control bar. When you're finished, use the Stop Recording keyboard shortcut you specified earlier or click the Done button on the control bar. When the Insert Slides window appears, you'll have the option to change the default name of your screen recording so it's identifiable later. Just enter a name in the Name field at the top of the window. Now you're ready to insert the screen recording into your course. Depending on its purpose, you can insert it as a Video on a single slide, as a series of Step-by-step slides, or both. To learn how, see this tutorial.